I’ve just left the Nokia World 2008 keynote, in which the new products and services were announced, like the Nokia N97, Nokia Maps, and Nokia Messaging. The presentation was interesting, and highlights Nokia’s vision for mobile communications. Read on for a quick summary and some thoughts. Annssi Vanjoki — EVP of Markets — introduced the Nokia N97 itself. He opened by talking about the N95, which he described as the “state of the art” mobile computer. It’s sold more than 15 million to date, and is one of the fastest selling Nokia products. The N97 evolves upon the N95. It has a bigger screen (3.5″) with 640×360 pixels, 16 million colors, a real camera (“not a toy”), and seeks to “sense context” to make it a real mobile computer: AGPS, digital compass, accelerometers. Widgets on home screen allow you to personalize the device to be useful to your workflow. One of the things that really piqued my interest was the claim that mobilizing social networks will change the way people communicate. To this end, mobile computers need continuous internet access. “I want to surf the ENTIRE internet, not just some pieces of the internet,” which is a statement I absolutely agree with. It was said that mobile computers need to support all forms of web pages, especially video. The N97 aims to be as capable of an Internet-connected computer as any desktop or laptop. 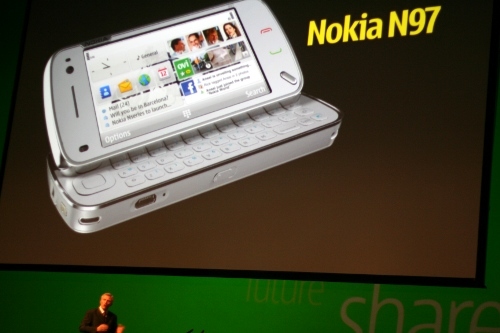 The other big thrust of the N97 announcement is that It’s not just a consumption device, but also a creation device. It needs input mechanisms, and while a touch screen is nice, it’s not sufficient according to Nokia (a clear dig against Apple’s iPhone here). “Nothing replaces the feel and accuracy of a real keyboard.” The 35 degree tilt screen provides better ergonomics for real computing use. At 550 euros, the big question becomes “why would I buy this as opposed to a netbook?” Indeed, this question was asked several times of various Nokia employees at the blogger dinner last night. At twice the price of most netbooks, the N97 superficially doesn’t offer too much new functionality, especially for casual and budget-minded consumers. When you look a bit deeper, though, you begin to see a pretty big distinction by way of the mobile services Nokia is ramping up. I think it’ll be interesting to keep an eye on these applications and services as the N97 gets closer to market. On a totally personal note, Nokia did a great job on the keynote. It was well paced, interesting, and informative, which says a lot since I knew going in what the big announcement was going to be. I’ve been to too many keynotes that were dry, laborious, and downright boring. Kudos to Nokia for doing it right.